Please bear in mind that these screenshots are from extremely early in the development cycle – the final product may look quite different and there are plenty of things that still need work. I’m interested to hear if people think the tree view for the results works, as every other permissions reporting app I have seen tends to just use a table format (i.e each permission entry is on its own row, so you have several rows for each directory). 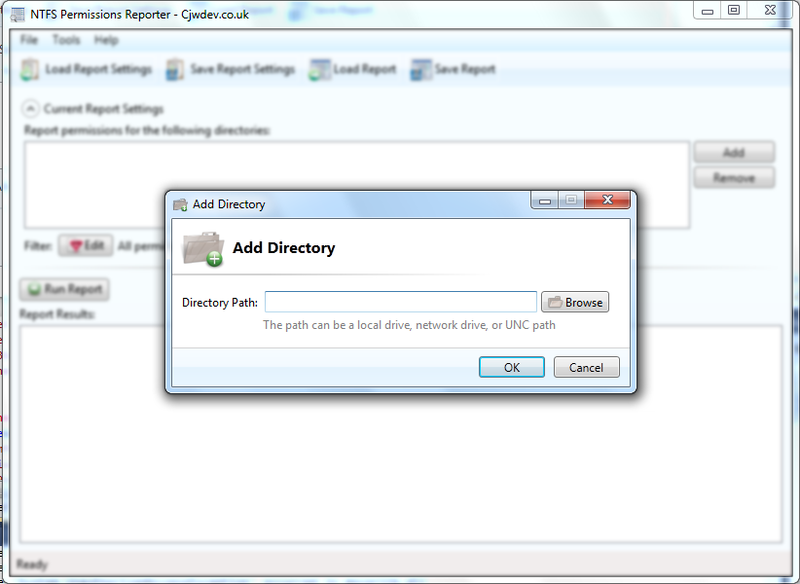 I made it this way because I find it much more intuitive seeing the results like this, as this is how we are used to seeing and managing directories – plus this way you only get each directory appearing once and if you want to see the permissions for a specific directory you can easily navigate to it rather than having to scroll down a table and look for the full path you are interested in. Let me know what you think of this layout (I will probably be including a table layout option as well, as this will be easier to export to Excel). As with most of my recent applications, there will be a Free Edition and a Standard Edition. I have not yet decided which features will only be available in the Standard Edition but will add another post on this blog when this has been confirmed. I know there is a distinct lack of decent free NTFS permissions reporting tools, so as is always the case with my free apps, the Free Edition will actually be useful and will not just be a time limited or heavily restricted version of the full version. Check back on this blog (or subscribe to the email notifications for new blog posts) for more information coming soon. And as always – feel free to let me know if you have any feedback. For what it’s worth, I really like the tree view. Much more intuitive, imo. Seems like a powerful tool– Look forward to seeing more! I have been looking for something like this. This one looks more promissing than the others i have looked at or tested. Looking to see more on this. hehe, just trying to get the junior programmer to right something like this and have had to take over to try wrap some of this functionality for him so he doesn’t go postal. Your articles have been helpful and I can’t wait to see the finished products. It would be great if you were able to see the difference between 2 runs of the report. ie run in Jan and again in Feb and the differences highlighted. Thanks Jason – that is definitely a feature I am going to include, hopefully in the first version but if not then in a version that is released shortly afterwards. Man, i would kill for a simple tool like this. I’m about to start a project to review and renew a fileserver that has not been reviewed for the last few years. Looks very promising. Looking foward to seeing this. Just downloaded you latest beta. This is nice and clean easy to use and read. I think the tree report is an excellent format. Would you be to be able to save the report in tree format? 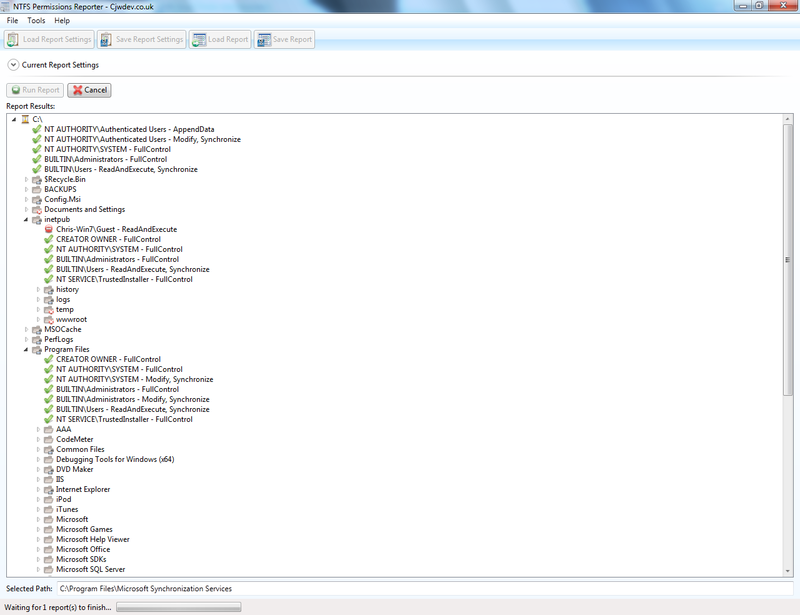 then replace Full Control with FC (etc) in the permissions (Advanced) column. 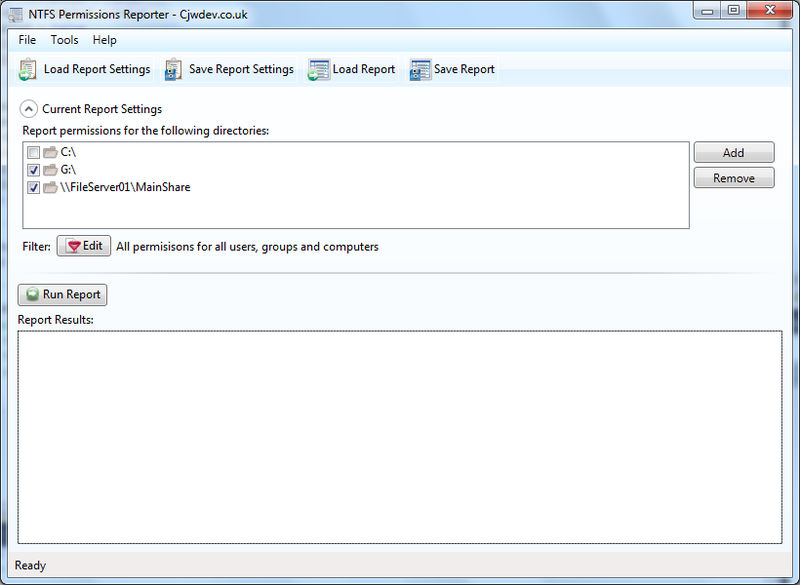 This would make the report much more compact and easier to see all on one screen. I know i can do this myself but thought multiple people might appreciate it. Thanks – the tree view is quite hard to output into a document, because in an application a tree view works fine as you’ve got scroll bars for when expanding the tree causes it to go beyond the size of the window, but in a Word document or something like that you’re limited to the width of a page so it becomes tricky. I will look at trying to get an HTML option working with expandable tree nodes, though I don’t think this will make it into the first release if I’m honest. Just found an issue for any serious business application. You need to be able to enumerate more then 260 Characters. I’m unable to see the results on half the directories in the main data drive of my server because the path name is too long. Is that a limitation of dot net? Still think its great but you cant go live with that issue. Hi Troy, this is a limitation of Windows (just google “windows 260 character path limit” and you’ll find plenty of info on it) and affects all programs not just mine. However, I did add a feature to the latest BETA that works around this by temporarily mapping a drive letter to the location if it is longer than 260 characters so that the path then becomes much shorter. Are you still seeing this problem in the latest BETA (BETA 3, version 0.9.0) ? Yes I am using the latest download available. ok that’s good to know there is a fix.